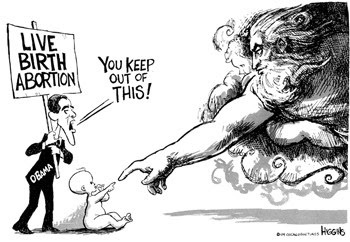 Obama insinuated opposition to abortion is based only on religion, lecturing pro-lifers like me to "explain why abortion violates some principle that is accessible to people of all faiths, including those with no faith at all." OK, Sen. Obama, let's reason. Explain why you support abortion for whatever rationale, at whatever gestation, by whatever means. Explain why you support infanticide, if banning it might interfere with abortion. Then, since you brought it up, explain how, despite all that, you think Jesus should vote for you, either now or in the hereafter, particularly given His statement, "It would be better to be thrown into the sea with a large millstone tied around the neck than to face the punishment in store for harming one of these little ones." Like you say, "God is good." Hey John It's Me Ricky. thats my new blog on this site, if I got it wrong...opps. But I want to start a blog with the lord in mind. Hey man, I just wanted to thank you for engaging in this discussion. I am ashamed to say that during this political election process, I've let my anti-war stance/feelings get in the way of much more important "issues" like abortion.